I mentioned this in 5.0.6, but it's the same in 5.0.8. No matter what I do, I can get the "Insert SuperStar Effects" to even show up as an option. Although this screen capture is from 5.0.6, I have the same result on 5.0.8. This applies regardless if I select a single pixel, a single group (for example one string of the pixel tree), or as shown below all 12 strings of the pixel tree. The second part of this question I'm certain that is just me not understanding the workflow steps in using the Pixel Editor effects. So, can someone please explain the workflow. I select a motion effect. Then go back to the grid and the no matter what I do, I can't get that effect applied to some segment of time. As soon as I select a chuck of time, the effect changes to "On" instead of "Motion Effect" and unselects the motion effect that I had selected. 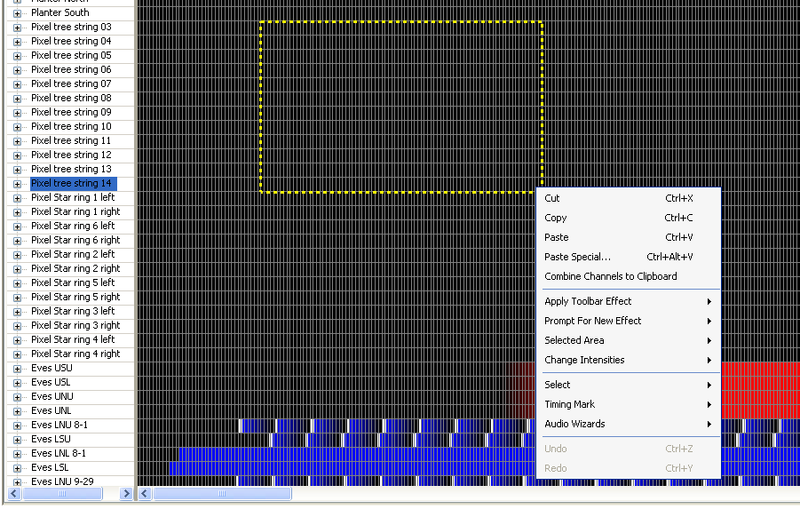 If I reselect "Motion Effect" and try to select a chunk of time, it tells me that "You must first choose an effect." I've tried using the buttons for Fade Up, Fade Down, and On, or the Select arrow and then the shortcut keys for On, Fade Up, or Fade Down; in every order that I can imagine. Nothing works. Like I said, I'm certain this is my lack of understanding. This beta release seems to have more issues than previous versions. I'm guessing due to the fact it was such a huge upgrade. Thanks to Jim and everyone else for beta testing the new release. I myself don't have the patience nor the time (busy finishing props) to deal with it. I should add that at least based on 5.0.6, this does seem to be related to how the Preview was created. If using a preview that was created from scratch in the Preview Editor, things work better than with a preview that was created from a visualization. I just don't want to have to spend many hours re-creating my previews from scratch. I have not had time to look into this angle in 5.0.8 yet. This post will just address inserting SuperStar effects into an S5 sequence. I will address the second part of your question in a separate post. SuperStar effects in an S5 sequence get placed on motion effect rows. And the command requires that you select a single motion effects row. Motion effect rows store motion effects (like the S4 Pixel Editor generated) and SuperStar effects. Use of motion effects generally requires a Pro level license. You can specify how many motion effect rows to create for pixel-based props when creating a new musical or animation sequence. You can also add one or more motion effect rows to a prop after it is created by right-clicking on a prop name and selecting "Add motion effect rows" from the pop-up menu. But wait I hear you say! I have a CCR tree and the way my Visualization file got imported into S5 created a separate prop for each CCR (or pixel string). You're not looking to sequence a prop, you are looking to sequence 12 (or 16, or...) CCRs. First, let's look at those CCRs (or pixel strings) that got imported into your S5 preview. During the import process, S5 tries to determine whether all of the bulbs in your S4 Visualization for each CCR are in a straight line. If they are not linear, then it uses the bulb shape for the S5 prop representing the CCR. If it is linear, it then calculates whether the line is less than or greater than 45 degrees. If greater (i.e. more up and down than side to side), then it creates the S5 prop using a Matrix Vertical Rectangle shape that is 1 pixel wide. If less than 45, then it creates a Matrix Horizontal Rectangle that is 1 pixel high (i.e. it assumes it is a horizontal matrix). For a CCR tree, you want to make sure the prop for each CCR in your tree uses the Matrix Vertical Rectangle that is 1 pixel wide -- again this *should* happen automatically, but you should check (if any use the bulb shape then change it). Next, you want to make sure all of the CCR props got placed together in a preview group. In S5, preview groups are more than just a collection of props -- they can also be sequenced using motion effects! In most of S5, groups appear in blue text. So in the S5 Preview Design window, look for items in the list that are shown in blue. If your Visualizer file had the CCR fixtures grouped into a Visualizer prop, then that Visualizer prop should have gotten converted to an S5 preview group. If you find the group for your CCR tree, then double-click on it to bring up its properties. If not, select the CCRs in your tree (you can use shift-click and ctrl-click to select multiple props), then click the "Create Group" button. Either way, you should now be looking at the Preview Group window. The important setting here is the "arrangement" -- how the props in the group are related to one another. Make sure the arrangement is set to "Horizontal Stack" and that the CCRs in the group are listed from left to right (with the left-most CCR at the top of the group member list). Save the group and save the preview. In your sequence, make sure the group for your CCR tree is listed in the grid. 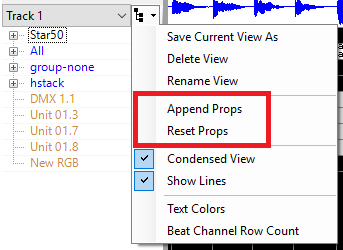 If it isn't, then click the icon just above the list of prop names in the grid and select "Append Props" (see picture at the bottom of this post). In the Select Props window, open the Preview Groups section of the tree and place a checkmark next to the group for your CCR tree. That group should then appear in the right-hand box. Click ok. The CCR tree group should now appear at the bottom of your sequence grid. Right-click on the group name and select "Expand". You should now see 1 or more motion effect rows for your group. Select a section of one motion effect row, then right-click. You should now see the option to "Insert SuperStar Effect". Looking forward to the second part - on the workflow. A little followup. I've had several back and forth messages with Brian Bruderer, and I have some more data (I think). I don't have any motion effects rows, and therefore can't select them. I was not understanding what a motion effect row was. I also don't have the option of creating them unless I expand all the way to the individual RGB or single color pixel or bulb (which seems pretty useless). Even then, it does not appear to work - nothing happens after telling the pop-up box to add some number of motion effects rows. A little more playing and it appears that maybe if I create the prop from within the Preview Editor instead of importing from a Visualization, I really do get motion effects rows. So it's looking more and more that this is related to using a preview that came from a visualization import. I just don't want to have to spend many hours rebuilding my layout in the Preview Editor. However it's looking like I don't really have a choice. You sent me a viz file that did import into S5 just fine on my end. As I understand it, you are wanting to import your older S4 file into S5? First things first, it seems to me that you have a good viz/preview file to start with. I would suggest using the one you sent me as a starting point. It's name was 2017 yard Real 2017-05-21.lee. I still have it, in case you modified yours. If that viz file imports, you should be able to choose SS effects under a prop that is RGB. As far as getting your older S4 to update to S5, try opening an older S4 version of sequence that is not saved with Intensity files but saved as a .lms files. (i.e. the older way of doing it) That is the only way I have figured out how to do it. Try that, see what happens. Believe me, I know it's frustrating. Using your 2017 yard Real 2017-05-21.lee file imported in Preview, I am able to add SS effects into a sequence. All these effects were added using the "Insert Superstar Effects" option. Here's a quick gif to show you it works. If you have an older S4 .LMS sequence you want me to try sent it to me, I'll give it a go. Yes, I do have it here at home, but I was playing with 5.0.8 today at work where I did not have the modified version that you made up. Appears that the issue is related to using a preview that was created from a visualizer file in combination with a sequence from S4. I'm still trying to figure out the relationship. I also have a phone / computer remote session scheduled with Matt Thursday evening. In moving my 12CCR tree from the S4 into the S5, I do have full access to the CCR's once I created a group - but as yet don't have the 5 channel star topper - even though I made it part of the group. The Superstar display shows the tree-shaped CCR, and has the 12 column grid to program in - I believe I saw in the S5 "want to have" list the intent to include the CCR tree topper - so maybe later. I have been opening my S4 shows from last year and converting them into the S5 format (now on 5.0.8). Interesting. You may recall that a month or so ago I did a test where I ran a version my evening landscaping show that had sequences that were created with the following formats: Files created in S4 SuperStar and exported as Intensity files, files created in S4 Sequence Editor and obviously NOT using intensity files, and files created in S5 Sequencer (I think it was 5.0.4 when I did this test). They were all played from the S5 show player. The show worker perfectly (including interactive sequence groups). With the exception of about a half dozen channels, everything in the yard is RGB. The test was performed using a Windows 7 laptop. I did see that thread, at the time I was in the hospital with some good meds so all the info didn't sink in. Anyways I got my props to light which means I have good Previews now. I agree that being able to put SS effects into S5 needs a lot of improvement. For now I will keep sequencing in SS then copy/paste the .lms file into S5, seems to work well. I still can't get my arches to play. They work in the preview, but apparently there is nothing on the card. The arches are CCPs -two strings per controller, one string per arch. The SS4 version with 2 arches works. I created the preview from scratch and created the SS sequence using the insert function. I have a group for the arches. However, I had to sequence the arches one at a time. SS didn't behave well trying to program the group. Maybe someone can see what I missed. My arches work in S5, converted from S4. My definition of the arch has PixelCurvefor the Dimming curve (all else is the same as you set), and my group is set to NESTED. I found set this way, Superstar would properly show the arch group, where set to USER PREVIEW it was very messed up. That solved my programming difficulty. I can now program the group in SS from S5. It plays correctly in S5. Now to figure out why it doesn't play on the mini director.